we will not rest until those responsible for the murder of our sister is rightly punished. Riverdale Season 2 Episode 19: "Chapter Thirty-Two: Prisoners"
Veronica: It’s ransom money. Not for Archie, I got him back. No, this is from when I turned the tables on Nick and held for ransom instead. His parents gave me a cool million for my trouble. 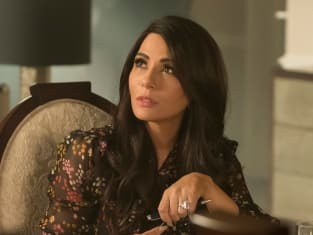 Hiram: I told you I was handling the St. Clairs. Veronica: Funny enough, they hadn’t heard boo about Archie’s kidnapping, but I’ll leave that to you to explain to Archie. He’s in the study waiting for you. Permalink: It’s ransom money. Not for Archie, I got him back. Veronica: Are you okay? Whether or not The Black Hood is back, I don’t want “Death Wish Archie” to come back. Archie: You saw that note, Veronica. Written in Midge’s blood. If The Black Hood is going after victims who escaped him, that means my dad is next, or Moose, or Betty, or you, or me. It could be anyone. Veronica: That’s exactly why I need you sane and steady right now. Archie: I am. I will be. Veronica: Promise me you won’t patrol the streets or break into Svenson’s house. Veronica: It’s just, I can’t bear the thought of anything bad happening to you. Permalink: That’s exactly why I need you sane and steady right now.